The Russian probe failed to achieve its intended Mars trajectory a few hours after lifting off from the Baikonur Cosmodrome on Tuesday at 21:16 CET. 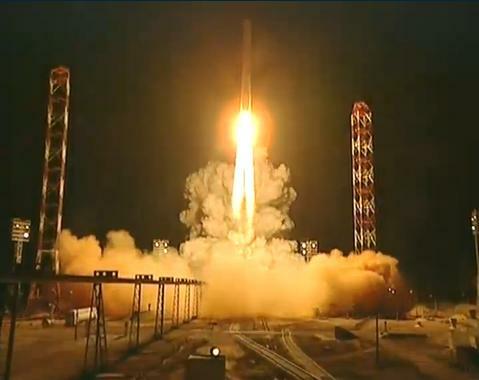 The Russian space agency Roscosmos has 3 days to fix the problem. The Russian Phobos-Grunt probe lifts off atop a Zenit launcher from Baikonur on Tuesday at 21:16 CET. Credits: Roscosmos. The Russian Phobos-Grunt probe, carrying several French experiments, failed to achieve its trajectory towards Mars a few hours after lifting off from the Baikonur Cosmodrome in Kazakhstan. It is currently stuck in Earth orbit, indicated the Russian space agency today, adding that it has 3 days to set the probe on its correct course. “The engine did not fire […]. This means that the craft was unable to find its bearings by the stars,” said Roscosmos chief Vladimir Popovkin, cited by the Interfax news agency. But “we have 3 days, since the probe’s batteries are still working,” he added. That’s how long the agency’s engineers have to upload a new flight program before the batteries run out, Mr Popovkin explained. “I would not say it's a failure. It's a non-standard situation, but it is a working situation,” he said. Phobos-Grunt—which means Phobos-Soil in Russian—was launched on schedule Tuesday at 21:16 CET atop a Zenit vehicle from the Baikonur Cosmodrome in Kazakhstan. The flight controller announced that the probe had separated from the launcher and that Phobos-Grunt had reached Earth orbit. The planet’s gravity was then to have set the probe on course for Mars, but this manoeuvre failed. According to a Russian space industry source cited by Interfax, a fault in the probe’s management system is thought to be the root cause.